All pictures by Dermot Breen. 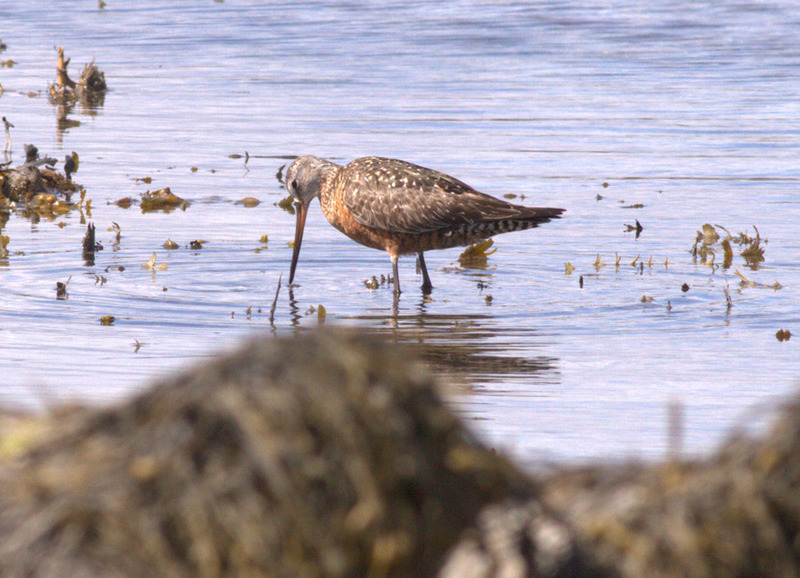 Hudsonian Godwit Limosa haemastica, Inishdawros, Galway, 22nd July 2015. On 22nd July 2015 I decided to head down to the Ballyconneely area late in the day to have a quick look around. I took the coastal road from Ballyconneely towards Roundstone village. As I was driving along I saw that the tide was out as I was passing at Inishdawros. This is an area of exposed sand interspersed with seaweed covered rocky outcrops with Inishdawros lying about 250 metres off the mainland. Like many other wader sites in Connemara it generally holds only very low number of waders even during the height of autumn and winter. I had my first notable bird here only last September in the form of a Curlew Sandpiper Calidris ferruginea. The Connemara area of Galway, like many parts of Ireland has received scant attention up until relatively recently. In the last ten years though we’ve managed to pick up fifteen Dotterel Charadrius morinellus, ten American Golden Plover Pluvialis dominica, at least twenty Pectoral Sandpipers C.melanotos, five Buff-breasted Sandpipers C.subruficollis and single White-rumped Sandpiper C.fuscicollis, Long-billed Dowitcher Limnodromus scolopaceus and Lesser Yellowlegs Tringa flavipes there. The huge majority of the Nearactic vagrants really only appear from the second week of September onwards and most of these are predominately juveniles. 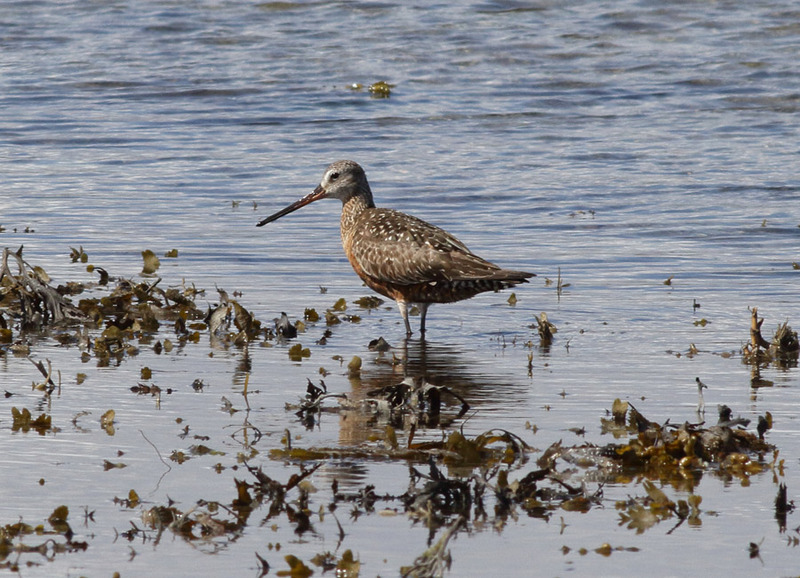 We’ve only ever had one juvenile Pectoral Sandpiper and a second-calendar year American Golden Plover in August. So you can imagine I certainly wasn’t expected much on this early date. I wanted to check through the small waders, the Sanderling C.alba in particular. I occasionally come across the odd colour-ringed birds some of which have returned for several years now. There were around 30 Ringed Plover Ch.hiaticula and twelve Dunlin C.alpina in their usual spot but there was also an adult Little Tern Sternula albifrons with two flying juveniles. I had driven out across the strand but decided to park up back on the mainland side and come back to try to get a few more shots. I didn’t want to get cut off with the incoming tide. At least I would be able to wade back in if the worse came to the worst. On returning to the area the terns quickly left. I decided to check one area in which they had been feeding a few minutes beforehand. Suddenly a large wader flew from my left to right and dropped behind a large rock. As it passed within 30 metres of me it banked twice as it appeared to land. 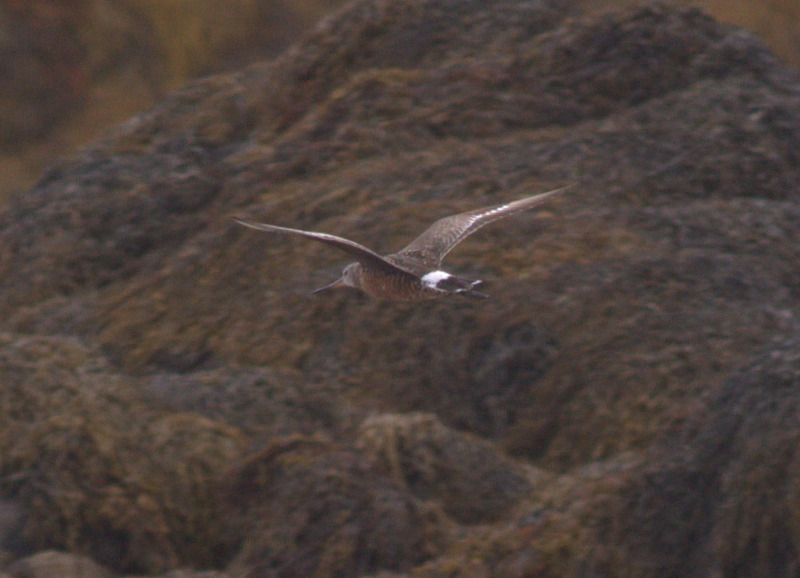 I didn’t have time to raise my binoculars but even with the naked eye I could see that it had entirely black under wing coverts, rusty underparts and a clean white rump offset by a black tail. 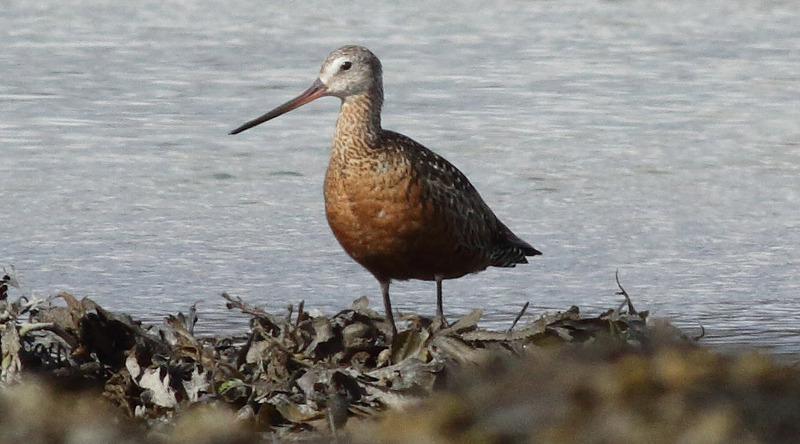 It couldn’t be anything else but a Hudsonian Godwit – bloody hell! My heart rate instantly sky rocketed. I just prayed that it would stay still for a record shot. As I peeked my head over the rock a few Redshank T.totanus and Greenshank T.nebularia exploded off, calling as they went. Not what I needed. Thankfully there it was standing on the water’s edge. It almost looked a big summer plumaged dowitcher species for a split second. I watched and photographed the bird for about twenty minutes before it got up and flew in a big arc around the strand but quickly appeared to land into amongst more seaweed rocks. There was no sign of it for 30 minutes. I then checked the original spot and much to my relief it was back again. I ran back to the van to get my tripod and scope and it was still in the same spot on my return. After only ten minutes it got up again and once more disappeared, this time back to the same spot it had last hidden itself. The tide was now rapidly rising and I had to head back to the mainland side of the strand before being completely cut off. Around the same time a family with a dog in tow walked through the area I last saw it land in and I never saw the bird after this. I picked it up at about 16:25 and last saw it at 17:25. The two nearest birders both live in Galway city which on a good day is an hour’s drive away but to due to rush hour traffic and road works it was nearer to 90 minutes before they managed to get out which was unfortunately too late. A few others who travelled from even further afield such as Dublin, Cork and Kerry inevitably missed it, as did the fifteen or so that twitched it the following day. This bird was accepted and published as the first Irish record in the 2015 Irish Rare Bird Report (Irish Birds 10: 404-405). It would appear to be a different individual from the one that was seen in Somerset, England the previous May. 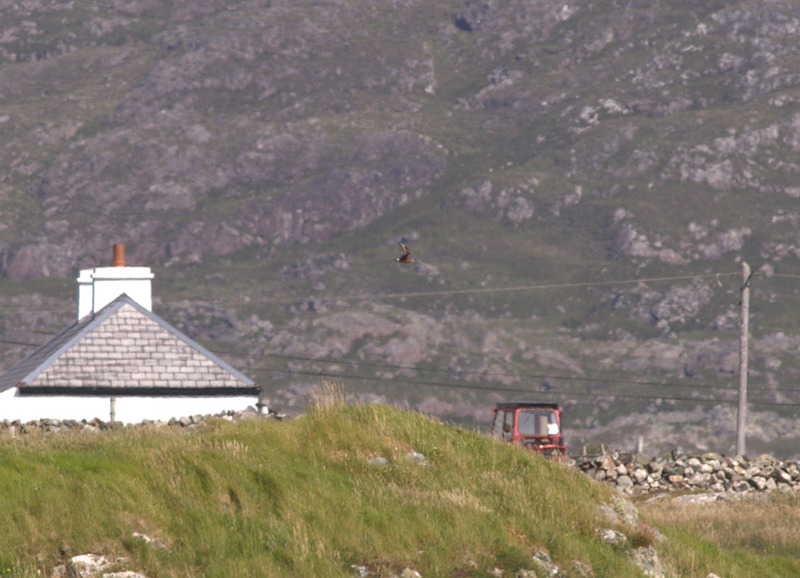 While that bird was probably a female, the Galway bird is probably an adult male. Males are supposed to leave the breeding grounds earlier than females, from late June compared to from mid-July respectively. Compared to the Somerset bird this had fewer and weaker black barring on a brighter rusty belly and flanks but with bolder black barring on the undertail coverts, less white tips to the under primary coverts, a weaker supercilium behind the eye, a whiter head contrasting with more heavy streaking on the neck and although it was hard to accurately judge size it didn’t seem to be Black-tailed Godwit L.limosa sized but closer to Bar-tailed Godwit L.lapponica. Amazingly the same bird turned up again almost two months later on 15th September at Kilmurvey on Inishmore in the Aran Islands and this time it hung around until 17th September allowing most of those who dipped out the previous June to catch up. It’s been some time since I’ve managed to find myself a lifer in Ireland but this was a great one to pick up considering how scarce they are in North America with a total population estimated at only 70,000 birds. I must say the whole thing was a bit surreal but it just goes to show anything can turn anywhere at any time. A selection of pictures taken on the day by Dermot Breen. Click on the thumbnail for larger images. 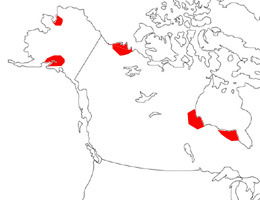 Hudsonian Godwit breeds in disjunct locations on arctic tundra in Alaska, northwestern Canada and the southern shore of Hudson Bay. 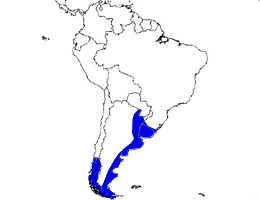 It is a long-distance migrant passing through the Americas to winter on pampas marshes and coastal mud flats in South America (mainly in Argentina). As of summer 2017, it is an extremely rare vagrant to the Western Palearctic with just six previous occurrences. There are three British records; the first for Britain and the Western Palearctic was an adult at Blacktoft Sands, Humberside on 10th September 1981 that returned to Devon in 1982 and again to Blacktoft Sands in 1983, the second was near Collieston, Grampian on 26th September 1988 and the most recent was at Meare Heath, Somerset in May 2015. Elsewhere in the Western Palearctic there are single records in Denmark (1986), Sweden (2003), Azores (2007) and Norway (2008).